Ghost Koi - What the heck is a Ghostie? It seems a Ghostie is a mis-fit or the right-fit Koi, it just depends who you ask. So, what are these Ghost Koi I've been hearing more and more about? Well, it seems they have been around since the early 1980s when a British farmer allowed a mirror carp to spawn with a Koi. The offspring from a cross of a metallic Koi and a wild, dark-colored carp are known as Ghost Koi. Notably, the most striking areas of a Ghost Koi are the metallic head and flashy pectoral fins that glimmer in the sunlight and disappear into the depths of a dark pond like a ghost, hence the name. They are considered a hybrid, being a cross within varieties of the species Cyprinus carpio creating feritle offspring. Koi purists tend to relate to them as mis-fits that should have been culled and do not find value in them. Garden pond owners relate to them as being vigorous, hardy, tame, rewarding to view, and more affordable. A novice or beginning Koi enthusiest may find them a great first Koi as they are considered tough as nails requiring less pampering, have a natural high disease resistance, and grow rapidly, because of the stronger genes passed from the broadstock carp. As they are not a high-grade Koi, requiring generations of breeding and farming, a larger percent of offspring reach the market making them more affordable. The coloration is made up of whites, silvers, charcoals, gun-metals, and golds. Ghost Koi can also have a variation of scale patterns, including fully-scaled small scales, large mirror scales, linear (lateral line and dorsal) scales, and leather (scaleless) variations. Gin rin (sparkling) variations can also occur within the fully scaled. Because of their resilience, they require less demanding and sophisticated filtration systems to maintain superb water quality and do well in garden ponds; this also makes them more affordable. They are less effected by common Koi ailments, such as ulcers, which is another advantage for the novice and hobbist. They do benefit from a large pond and a well-balanced food compared to premium-grade food and color enhanced food. Their color pattern appears on younger Koi and is stable throughout its life. So, it seems, beauty is in the eye of the beholder and Ghost Koi are finding their niche in the market and in ponds. 38 year old pet Goldfish! Most pet goldfish live between five and ten years. But some goldfish apparently have other ideas. 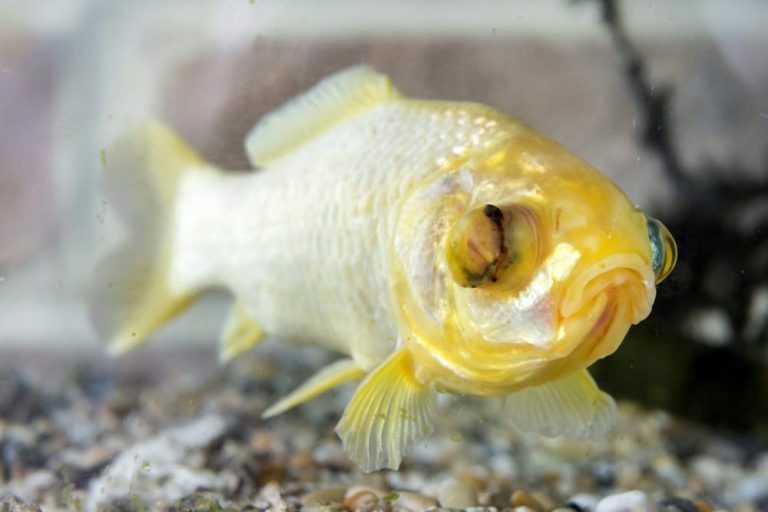 Here’s an amazing post about a pet goldfish called Splash who has just celebrated his 38th birthday! In 1977 Richard and Ann Wright’s young children won a little goldfish at a local funfair. They took him home and named him Splash. Astoundingly, Splash is still alive! He’s just celebrated his 38th birthday. The tiny fish has lived through two Gulf wars, the assassination of John Lennon, Charles and Diana’s wedding, and the 2012 London Olympics. That’s nearly four decades of history! Sadly, Splash’s tank-mate, Splish, died two years ago. Splish was no spring chicken either, and was 30-years-old when she died. Luckily, Splash has continued t thrive despite Splish’s death. The Wright family claims that they haven’t done anything special to extend their goldfish’s life span. Maybe the lucky little fish just has good genes! 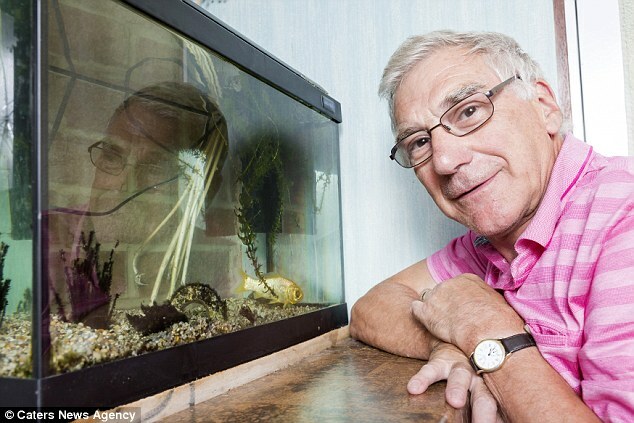 The 71-year-old owner of Splash the Goldfish says: “He looks as if he’s coping fine but I’ve no idea how he’s still alive. It feels like he’s been around forever and he’s even outlasted our children living at home with us. We’ve never done anything out of the ordinary to care for Splash – we’ve been blessed with a really hardy fish who’s lived through it all." These pictures are the completion of this project. Here we are the day after the bottom drain was set to dry over night and we can now start filling with water. The most important aspect of filling the pond up is to go slow and pull the liner into position. As the water fills your pond the liner will be pushed against the walls, so work out all those kinks and folds as you go. Here I have bulges in the padding under the liner. These need to be flattened and molded to fit cleanly. Continue working your way around and around the liner constantly tugging it upwards . Best technique to lift the edge of the liner and release as the water flows back. Here I am using this technique to lift the liner completely and then allowing the water to mold the bog area which is round and adjacent to the oval main basin. Tricky area here as there are shelves on both sides of the entrance to the bog. The bottom of the bog is to be flat and the excess from the folds in this area are being manipulated. Here we are filled and its time to connect the filter. This was our original filter. Its was a used filter that we thought was a bargain but ended up being a teaching moment of buyer beware. Ask questions like how long has it been in the sun? When was the last time it was used? Take a real close look at seams and seals. Here you can see the drip coming from the threaded area. Also, you can see there is white all along the bottom seem of the intake where this was repaired before. Here is what it took to repair this seam. Some things you don't know until you plug all the peices together. Once the filter was on water was seeping up from the handle which meant that the spider seal was compromised and needs to be replaced. Here is the pond on April 10th running on the used Advantage Bead Filter. This is a brand new Ultima 2 filter. The homeowner and myself decided that for the life and longevity of this new pond. that replacing the filter was better choice than repairing from the very beginning. Time to start placing the birdbaths which are apart of the waterfall. This birdbath is actually on 3 layers of liner. Under the liner are strips of liner material covering the cement blocks. On top of these blocks is the main pond liner which stretches up beyond the waterfall. Attached to the waterfall basin is a 3rd liner which drapes over the main liner. Under each birdbath and any huge rocks are smaller pieces of liner that is cut and layed on top of the top liner. All these layers are necessary when placing waterfall stones. Most accidents and holes and leaks are caused by rock and slate being slid and rubbed across the liner. Remember to lift and set rock down and lift it straight up. Dragging rocks around the waterfall can ruin the whole project. The sides need to be leveled high above the water line. Time to step away and come back tomorrow. This is about a week after and green water is expected in all new ponds. This is the process of a new pond. This is actually a basin of water that is chemically being turned into the water of an eco-system. This is my original sketch for this project. Here we are at the beginning of May and the first plantings have gone in. The finished pond is 1350 gallons. Once again, we've had rain issues, but this day was high and dry, so let's lay the liner. This is the most exciting and nervous of all days. Thanks Sequoia for taking the pictures today and to Marla for coming to help pull the liner. Here is my last photo of the water fall. The rocks and birdbaths will be removed so the liner can be spread underneath. This is my first stab at the return plumbing. The white male adapter on the right is not snug. I may end up having to replace this connection and the valve shown. More to come on the redo of this. I just want to get the system up and running. This will be the return of the waterfall. We will be using the previous liner as an underliner. Normally not necessary, but do to soil issues, we are going to use it. Cleaning up the mud that's collected on the seal surface of the bottom. I want to keep this really clean. I also pushed in a few rocks to level the bottom drain one last time. Many hands make quick work. "Grab me that". I found the night before a load of carpet matting. The best thing to use under the liner and over the ruff edges. A great shot of how I hung sheets of the matting along the perimeter. I'm feeling a little sideways here. I just remembered to cut away the first liner. Here is the under liner and I should have cut that hole a little larger. Remember to take your time. I get excited putting these parts together. OK, its time. Everything has been padded with matting and the pre-liner is in and the new liner is spread out ready for the unfolding. Shoes off. There is absolutely NO dragging, stepping or pulling at this point. Every move is small. Tearing the liner at this stage would be heartbreaking. Pulling and shifting. Feeling one with the liner and how it falls. Working on those folds. Once the water fills up the walls it is virtually impossible to pull the liner. The weigh of water will win every time. Final fold and at some point you have to just move onto the next step. I have plenty of liner covering the waterfall area. Here we go. All those sleepless nights comes down to this final huge step. Sealing the bottom drain. Remember to breathe. I use a buddy here, just someone to sit on the side and be with me. If you have never done a bottom, don't panic.. Here I have committed to my center. I have cut a small 3" hole in the middle of the bottom drain. If I were to make the hole larger it could tear. This bottom drain has a second port. I am screwing it in tightly. I also glued up and capped this second port. There will be only one, 2" drain port. GE Silicone 1* is a Window sealant that is 100% silicone and Does Not contain Mildew Retardant. I silicone everything. Every step of the way. Leave no crack un-siliconed. It may be over kill, but this is the most important feature of making your pond. Lining up that first hole. Second hole is ususally a little more difficult. Remain calm, you are almost done. All lined up. Do not take a break. Keep going while the silicone is drying already. This is a fiber gasket that I rolled a bit of silicone on. I silicone everything. The bottom drain plate and the final piece to the bottom drain. Using the fiber gasket I line up the hole of in the plate and screw down into the bottom drain. Eight screws to the promised land and everything get screwed in clockwise, snug and tight. I now am cutting away the interior with a sharp knife. Here I silicone the inside of my plate the has connected the liner to the bottom drain. Here is the completed bottom drain that we leave to dry for a day and we will then be filling with water. Greetings from February, as it rained here in the SF Bay Area pretty much Dec. and Jan. I did not make my former completion which was end of December, Mother Nature had other ideas. I am back and this project is in full swing again. Enjoy! This is the 2" bottom drain we are using. It has an alternative exit for plumbing. I have capped this end. This bottom drain is not the KoiToilet variety as that one come with a dome top. Aurora has fancy goldfish and we needed a bottom drain that was a complete plate with holes. Will show this off when we get to actually put this project together. I was not satisfied with the original thicker border plastic I was using, trying to create an inner circle for the bog shelf. I found this much thinner and pliable border material. Here I was able to measure, carve, level and fit my shelf wall. Finally the curve for a shelf is about 18". I used that little section of ABS to keep me within a birds eye of the outer wall. You may have seen in former blog pics that I had the shut off valves from the bottom drain and the skimmer right at the end of those pipes. This was an incorrect position as it needed to be much further to the right. I extended these. This is another perspective from the bog and the placement of the bottom drain. I am always nervous about committing to having a sealed bottom. My best advice is to go slow. Practice on misc. ABS/PVC pipes and fittings to understand the amount of glue and giving each piece of the plumbing a good have turn. Which brings up, thinking ahead of your plumbing and how you can always add on. Fitting pieces in the middle of plumbing could lead to having to cut out large sections and redoing it. Once I committed to my plumbing, I placed rock around the base and back filled to secure. I also sprinkled small rock around the bottom drain ABS ans back filled it also. I have one word for you through out this procces. It is to "LEVEL, level, LEVEL." Use of a line level is my personal favorite. Here is my, one per pond job, table level that is injured, but still holding true. Returning to the bog we excavate another 6 inches or so, bringing the center depth to 2 ft. for the waterlilies. Here I am with my extended plumbing to the filter area. NOTE TO SELF: Becoming over zealous in success of plumbing will keep you awake at night. Ideally it would be great to have the entire eco-system up and running to test your plumbing, but you have to have faith and trust that in each connection is sound before moving on to the next. Here I did cover too soon and had not done a proper water test. The area behind the plumbing is the future home of the filter and pump pad, which needs to be dug out. I did come back and do a water test. I extended the bottom drain and did a pressure test of the skimmer line, by plugging the skimmer hole and filling that line with water. I like to cover my plumbing with small gravel and loose soil. I then will cover plumbing with large flat pieces of stone or lava to protect any downward pressure on plumbing from people walking on the surface plus the dirt used to cover them up. Also here, you can see that I have measured where the base needed to go and have dug out accordingly. There were many chunky roots from the creeping fig that covers the back fence. One gnarly extension of this root was sacrificed and the other allowed to grow downward. The platform used a large bag and a half of concrete. We are ready for the filter! So here is our 2000 gallon filter sitting atop its new platform and the plumbing for the pump has been measured, trimmed and placed. I am very pleased with how compact I have been able to make this setup. Here is where I used an irrigation trap to cover our cut offs for the bottom drain and the skimmer line.. The greatest invention to any pond owner, is the use of these rubber connectors that clamp onto existing plumbing. They allow some give and take. We live in earthquake country and having an exactly rigidly glued together setup can be a problem. You have to think about your pond as giant bathtub. The equipment you use on your pond is external and man-made contraptions that process the environment for your eco-system and any and of all of these external pieces can and will FAIL at some point in the life span of your pond. Allowing each piece of your filter and pumps and UV's to be put together with these rubber fittings, will each pay for their use ten fold. Oh, by the way, when you let it rain and the grass grows, give it a mowing! We move onto the waterfall now. I have already started to edit the site line, by removing rock from the waterfall. Moving closer to liner day. Continuing on through this project right now, there are lots of different moving parts. Take a breathe and keep on, keepin' on, because soon we reach a monumental point. This shows our points of the bottom drain and the skimmer line coming into the pump and filter area. We will revisit this photo in the plumbing blog. You may notice that the back boards of our yard extends into a double layer which will hold our electrical plugs and on/off switch. That monumental day arrived. The electricians have run an electrical line down our trenches. We tied this pond wiring into its own switch in the panel We can now proceed to filling in our ditches and laying out the plumbing. The electricians are finishing up. We can now get down to building and pouring lots and lots of cement. Here we are accomplishing 2 things; we get nice foundation that is 4" deep to hold our top ring of blocks and we get that 4" of height from the last blog where we did not want run off from the lawn to flow intot he pond, we wanted to raise the edge 4". This photo is a milestone. you can see that the skimmer block with the TPR lines up with the foundation layer. The plumbing is connected and will be back filled with sand. You can see that once I pour each section of the foundation and it dries, I can dry install the top ring of blocks. By doing a section at a time you can use the row before to line up the following blocks and drive in your rebar in every other hole. This is a last shot of dry fitting of the bog area. We have completed the left side top ring from the double high block. This is a dry fit using a large tarp we bought for the rain. The tarp is 15' x 9' and our liner is a full sheet of 25' x 20' we are right on the money in terms of staying within our liner. The 2 biggest tools you can use in your build is a level and a line level. Every section every inch and over and over, drag that line level and check to see you are within the bubble lines. Here we have made it past our skimmer wall and am moving along the front. You can also see that the electrical and skimmer trench has been filled in. There are two points here. The first one is below the orange level and the second, is just to the right of the grey cement. We will save those points and make and shelf for shallow plants. The point will also support a large rock that will be half exposed above the water. I spray painted a ground zero block to which my line level could be grounded and everything else would now level off of this zero block. Using cardboard cutouts of the bird baths I realize that the bird bath should be one brick back, so that the bird bath can look like it is supported by rocks instead of liner sticking up above the water line. When building a pond you have to let the land you are working with speak to you and help you decide where things will go. Our turn of the top row allowed us to retain just enough space for a couple bog plants. This is Aurora and she is thrilled to see our vision becoming a reality. Progress. Just keep pouring cement. Here you can see both shelves. This is the connecting point, of the pond to the left, the bog to the right and my needing to keep a tunnel for the bottom drain plumbing. So I made one here and poured cement and a cement foundation atop it it. This will allow me to continue my foundation and top ring construction. You can spot a hint of my tunnel and I was 2 bags short for the foundation, back to the store for a 7-8 more. Here you can see ground zero block. The 3 rebar were trimmed to the inside of blocks. The bird bath has also been set in one, so the end product looks like it emerged from the rocks. Long horizontal rebar pieces were bent with a rebar bender and tied to the vertical supports in the base. Some will notice that the small square blocks came whole, they did not come with side slats for the rebar. I used a powerful drill with a cement bit, was able to drill out a couple holes down each side to chip that out. Most of the holes have been filled with cement and packed around the rebar. More evident on the turns there are huge spaces between blocks. Use cardboard to attach to the outside or inside of these spaces, using rocks to hold the cardboard in place and fill in those spaces outside the middle of the blocks. We now have a solid cement ring that is level. We have back filled and leveling the yard and our pond is indeed 4" above the grade level of the back yard. Several months of work has brought us to this milestone. The bog is the last thing to be dug out and commencement of the plumbing will be next. A view from the patio and house. Here is a last look at what was before. Notice the rocky background. The only level point is the string level. A string level is a necessary tool. There is more prep work and then more prep work before putting it together. There is now a solid back board that was leveled. In this project, these 2 birdbaths are most important to this pond owner and we will be incorporating them into the waterfall. The bottom center of this photo where the black/white pipe is where the bottom drain pipe will go. The orange line level keeps the perspective. Also, as you can on the far side of the pond is where the large skimmer was, a land bridge much be engineered. At this point we have decided that the main body of the pond will be 4'.6"w x 9'l x 3'.5"d. Take that equation and multiply by 7.5 to find out the gallons. Our pond will be in the ball park of 1086 gallons plus a bog. The area to the right of the orange level line was our first pour of a foundation base. When we leveled the block toward the front of the picture, we were at ground level. One problem with your pond being at ground level is that run off from your lawn and garden can flow into your pond ecosystem and that is not a good thing. We decided that we would bring the edge up 4 inches above the ground. This angle shows that the blocks would fit right over one another going across the land bridge where that skimmer was. When we place that foundation layer we should line up correctly. This is also before we bring in a large trenching machine. The trenching machine was a great help in cutting through this really hard clay soil. The trenches that were for the electrical were 18" deep. By using mason boards the foundation is being secured for cement. It is important to drive in your vertical rebar before you pour the bottom foundation. I did this by laying out a block and drive the rebar, line up the next block and drive a rebar. Lots of preparation before we start putting this together. This picture is a nice exposure of all three of our major trenches. In the far back is the bottom drain. The middle is the skimmer line. The front one is the electrical line. A dry fit of plumbing shows everything ending in the filter area which here is in the far back right corner. This is a Flanged TPR Connector that I have set in concrete in the block. The skimmer is suggested to be placed 13.5" inches below the water line. Engineering the skimmer wall by cementing in a base block. Mortared on the skimmer wall with our skimmer TPR in place. Also lining up skimmer plumbing. Dry fit of bottom drain. The Journey of Pond Gone Wrong to Something Wonderful! This ponds transformation began the first week of September and we are on track to completing it by Christmas this year. One of our newest members, Aurora, hired a professional Bay Area pond builder, just last year. She spent a small fortune. This builder, executed her pond in 3 days. OK, so here is a terrific example of a Pond Gone Wrong. I will spend some time pointing out poor choices that this builder made in his delivering a properly working ecosystem. The above view is from Auroras bedroom window and it is the only thing I can say that this builder did correctly. It is always nice to place the pond in a position that it can be viewed from many different angles. From this angle, you can see that the large square (bottom center) is a plastic lid to a skimmer that is best equipped for a swimming pool. Its placement is also incorrect, the return water coming from the waterfall traveled directly into the skimmer. There was no bottom drain. Without a bottom drain, silt and fish waste accumulates and turns into a pea green, mucky mud. Also, the liner is showing. This was the view from across the yard. It is simply too small for the yard. It looks like a pile of rocks. It is difficult to even see the two show pieces of the yard, which for Aurora are those grey bird baths. One of the problems with the placement of the bird baths is that they are placed too high here, at 3' and 3.5' feet in the air, when the wind blows, so did the water from the pond. The builder, must have tore the liner when he was filling up the pond with gravel and lining the sides with boulders, her water level was really low. Do to the low water, Aurora had to rig a net and stakes, to keep raccoon from eating her fish. Difficult to appreciate a pond when it is covered up in a netted wad. A properly built pond doesn't need these type of precaution. There is no organic use of the rocks. The water fall was placed in such a way as to need plastic ramps to try to direct the return line to flow into the pond. Here, you can compare the over-sized skimmer to the size of the pond. Although, the soil here is clay based and is really hard, one would not be able to fill this pond up because the top rim is not level. We haven't gotten rain in years, but if we were to get regular rain again, the top rim can sink or slope. Here is another example of how a professional might rig your setup and it is not legal. I am referring to the grey junction box you see there and the grey conduit. Several things, are wrong here. First, is that the power line was laid underneath the waterfall and directly under the sprinkler layout.. Second, the power supply was buried only 8" below the grade level of the yard, it should be 18" below ground. Third, is was tied into the house by being hot wired under the house onto another wire which tripped the bathroom circuit. One shot that shows how having the electrical line buried real shallow and directly under the water fall was incorrect. This picture shows the bowels of what we now have to work with. Let the planning begin. We did some digging here and made the choice to make the main body of the pond to be 4' x 9' x 3.5 deep and it will have a bog off to the side. In a few more blogs we will start working with math to find out how much the above equation of dimensions = how many gallons this pond will hold. Since this yard and hole has no actual point of level, we begin with a level line and some orange string to create the ground zero point that every other point of the pond is based upon. Tune in later for Part 2. Clear water, a view to the bottom of the pond, clearly visible fish, muscles and crustaceans, all surrounded by wonderful plants at the edge of the pond - this is what makes a water garden really fun. If only the old exasperating issue of algae didn't exist! If you look closely, you may suddenly no longer find it surprising to learn that those very garden beauties around the edge of the pond are, in fact, the death knell for water quality. This becomes particularly clear in autumn: Leaves fall from the trees or are driven towards the water by the wind, and bush leaves and branches, once bent elegantly over the surface of the water, begin to die off and fall into the pond. All too often the autumn rains wash soil and mulch into garden ponds. If you don't do anything about it now, all kinds of garden waste will find its way - albeit naturally - into your water garden during autumn. With fatal consequences. Anything that decays in the water now is twice as dangerous. For one thing, the decay of garden waste in water produces fermentation gases which, once dissolved, can endanger fish if gas exchange from and within the water is not possible. The decayed remains of plants also release their nutrient loads into the pond water, a malicious inheritance indeed. These nutrients feed the algae in the coming year. The most important rule of water gardens is therefore to prevent plants and nutrients from entering the water. To do so, spread a leaf net over ponds and streams to capture larger items. Trim back the plants at the edge of the pond so that no decaying leaves can fall into the water. Extendable shears are useful for this, since you can cut plants which are further away from the bank comfortably without getting your feet wet. Pond grippers with their long handles can also be used now to find and remove plants which have fallen into the pond. Hollow stems on bushes and grasses can be left on the plant unless there is a risk that they could fall into the water due to winds or snowfall. Garden insects like to spend the winter in them. Only cut these stalks in mid/late March and store them somewhere in your garden until the end of April so that the insects can leave them again. The remaining stalks still look beautiful throughout the autumn and winter when they are over-ripe, especially if they are illuminated during these dark seasons with effect lighting (garden lights).